For me, there is nothing better than spending a night pampering myself after a busy week at work. Taking time out for yourself to relax rejuvenate and really treat your skin is so important, especially with the busy lives we lead these days. The very fast paced lives we lead can really take a toll on our skin so we have to make it a regular thing to really give it a boost. I've created a video of the kind of routine I like to do on a sunday to really pamper myself. It gives me some time to myself to reflect on the week and really unwind before its back to work on monday. What are your favourite pamper products? Let me know in the comments below. Last weekend me and my Boyfriend went to watch Ride Along at the cinema. It was honestly such a funny film - we laughed the whole way through. I thought I'd share with you the makeup I wore and how I applied it to create this spring inspired romantic look. As always I started with a moisturiser, today I used the Nivea Day Cream before applying my Laura Mercier Primer. For this look I used my YSL Youth liberator foundation, I absolutely love this foundation and talked more about it in my recent February Favourites. using my fingers I applied this all over my skin. Next I used my Rimmel Wake Me Up Concealer and then set everything with my Rimmel Stay Matte transparent powder. For Bronzer I used my Estee Lauder Bronze goddess powder and then to Finish of the face I used a MAC 187 brush to sweep MAC Springsheen across the apples of my cheeks. Its no secret how much I love my original Naked palette, it featured in my January favourites and is still the palette I reach for first. I love the rose gold toned romantic shades. Using a Max 217 brush I applied Sin across the entire lid before picking up a small amount of Sidecar and applying this to the crease only. I then used my Eyeko pen liner to create a delicate winged liner before finishing off with my favourite mascara Loreal False Lash Telescopic. for brows I used my favourite brow product, Benefits brow zings (BEST BROW PRODUCT EVERRR!). To bring the look together and add that finishing touch I applied MACs Girl about town to the lips. What are your current makeup favourites? Today I have a slightly different post for you, but one I'm sure you will all support and hopefully share to help get the best result possible. 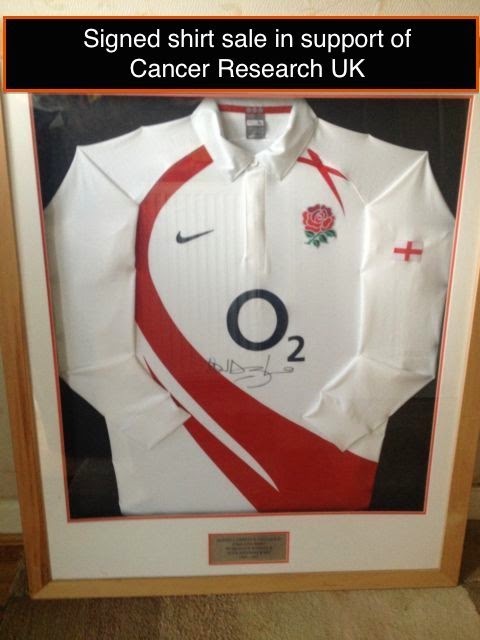 A friend of mine got in touch and asked me to let you all know about an auction taking place on eBay to win a framed rugby shirt signed by Lawrence Dallaglio - a world cup winner for England. 100% of the proceeds from this sale will be going to Cancer Research UK, so of course I wanted to let you all know as soon as possible and get the word around about this auction. I think its fair to say that almost all of us have been affected by this disease, whether it be directly or not I'm sure each an everyone of us know at least one person who has been affected by this awful disease. With Cancer making itself known in many different forms and variations, its up to us to support charities like Cancer Research to keep trying to find a cure. 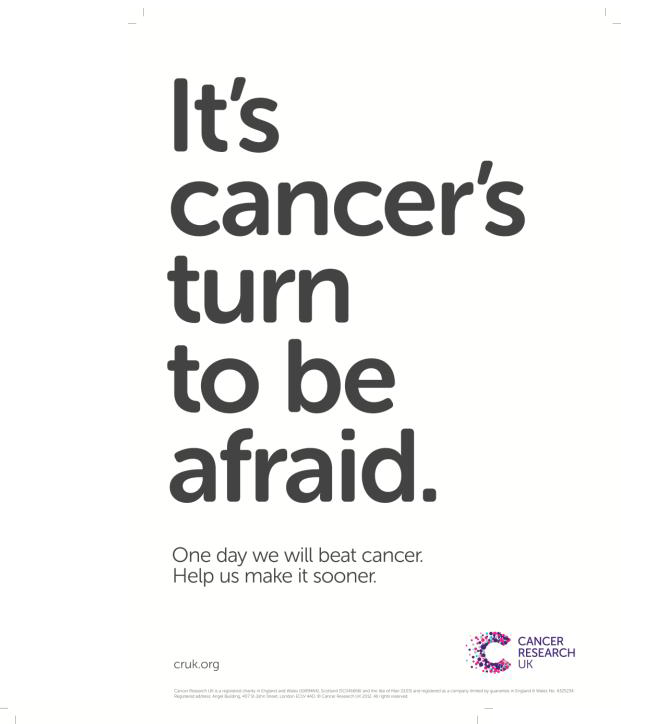 Cancer Research UK is the world’s leading charity dedicated to beating cancer through research. They have saved millions of lives by discovering new ways to prevent, diagnose and treat cancer, and survival has doubled over the past 40 years. Every day in the UK there are more than 400 people diagnosed with cancer that will survive the disease for more than 10 years thanks to research. Just click on Cancer Research UK to be taken directly to the website where you can find out more about the charity. The auction will be running until the 19th March and has a start bid of £50. You can go straight to the auction here. Please pass the post around and let everybody know about it and hopefully we can help this auction bring in a good donation for a charity that I'm sure is close to all of our hearts.